A while ago, I found myself staring at my computer screen, furrowing my brow, tilting my head from one side to the other. Flickchart.com had just told me to choose between Blue Valentine and Before Sunset. Two movies I really love, and I had to put one above the other. Do I go with all the wonderful conversations that are the core of Before Sunset? Or the powerful contrast between hope and dismay found in Blue Valentine? Should I take into account that Blue Valentine stands on its own better, whereas Before Sunset relies on its predecessor Before Sunrise to achieve its full impact? Or should Before Sunset be credited for achieving so much despite only being two people talking for 80 minutes? Should I just go with my gut-feeling? Which one would I rather watch right then and there? Reaching a decision took me a good five minutes, I reckon. There are those who say that making ranked lists of movies is a pointless endeavor. Films should be judged by their own merits and not just in context of others, they might argue. My take on it is that context is something we always use when thinking about films. I saw The Gold Rush back in July, which was not only my first Charlie Chaplin film but also my first ever silent comedy. Did I like it? Yeah, I did. It was funny and charming. But it was very different from the types of films I had seen before. It took a while for me to get into its groove. It seems likely that my opinion of it will shift when I get around to seeing more Chaplin films, more 1920s films, and more silent films. As it is, I can still evaluate The Gold Rush strictly as a comedy and determine if I like it better or worse than, say, There’s Something About Mary. But as I haven’t seen anything quite like it, I can’t compare it to movies that are more closely related to it. Still, every movie we see, no matter what kind, gives us some degree of context against which to judge every other movie. We rank movies all the time. Every time you give a film a review score of 8/10, you’re ranking it above every film you’ve given a 7/10 and below every film you’ve given a 9/10. When you call a movie the best of the year, you’re ranking it above all the other ones you saw that year. The issue people have with ranking, then, seems to be one more of degree than of concept. Any rating scale allows for a varying amount of ties. That 8/10 movie gets deemed to be in the same tier as all the other 8/10 movies. Are they all exactly equally good? Of course not. But the numerical rating is just a shorthand. If you write reviews, you hope that people will read the full text to find out what you thought about the film, which aspects worked for you and which didn’t. The score is just a quick summary. But when you go beyond these steps on your review scale to rank films, things can get very detailed. Too detailed for some. Saying that Casablanca is better than Sucker Punch may be easy enough, but is it better than Pulp Fiction? “Oh, I couldn’t say. They’re so different.” Well, Casablanca is different from Sucker Punch too, and that didn’t stop you from proclaiming it superior. “Yeah, well, I can’t choose between Casablanca and Pulp Fiction. They’re both great. Ranking movies is stupid anyway.” Except when it’s easy, it seems. This fictional conversation partner might have a point, however. Distilling all discussion on film to “good” or “bad” – and by extension “better” or “worse” – is reductive. I talked about this briefly in the opening of my blog post Noble Failures, where I argued that even overall bad films, or films we don’t like, can have parts or qualities that are worth discussing. “Good” and “bad”, like review scores, are just the sum total of everything we think about a movie. A useful shortcut in many cases, but we should be careful not to boil it down to this sum all the time. It’s a trap worth avoiding even when going into the specifics. The movie was “good”. Why? It had a “good” story and “good” acting. Why was the story good? Why was the acting good? But for the purpose of ranking movies, we need these shorthands. Once you take everything about a movie into account, from technical merits and emotional impact to story, acting, how much it speaks to you as a person and everything else, you end up with your opinion of the film. Making a ranked list then becomes a matter of weighing this overall opinion against the opinion you have of other movies. Is your opinion of X stronger than your opinion of Y? If yes, is it stronger than your opinion of Z? And so on. Compiling a ranked list is to make a series of choices between different movies. This is where Flickchart comes in. 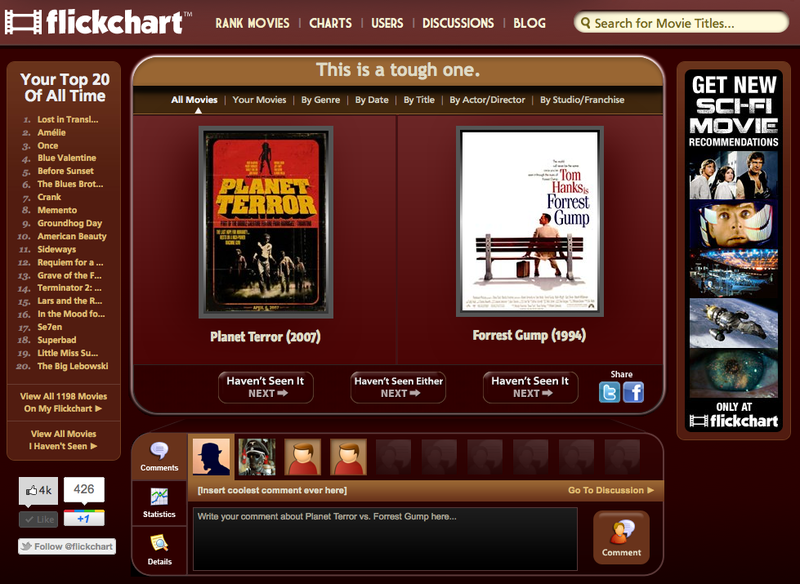 Flickchart, the brainchild of Nathan Chase and Jeremy Thompson, is a website that presents you with two movies. Pick the one you like best. Now you get two more films. Pick again. Repeat, repeat, repeat. If you get a film you haven’t watched, you mark it as unseen and get another one instead. Eventually, you get recurring movies in new match-ups. If you like Trainspotting better than Fargo, and then Batman Begins better than Trainspotting, that means you like Batman Begins better than Fargo too. As you go along ranking on Flickchart – which can be devilishly addicting – the site compiles a list based on all your choices: your all-time list, from the very best to the very worst. Eventually, you will spot things that don’t look right. The first movie you pick to win a match-up will end up at the top of your list, and if that one doesn’t show up in match-ups for a while, it will sit at #1. Maybe it doesn’t belong there. You can then look up that film and re-rank it. This will pit it against the film at the center of your list. Is it better? Then it gets pitted against the film a quarter from the top. The halving process continues until the film has been placed at its opimal spot on your list. You can then go back to ranking films at random again, or keep fine-tuning your list by re-ranking individual movies. A typical Flickchart match-up. Notice how your top 20 list is always staring you in the face as you rank? This is why most Flickcharters are obsessed with keeping their top 20 nice and tidy. Should you pick the films you consider your favorites, or the ones you think are the best? This is a hot debate topic among Flickcharters. Some like to focus on a film’s objective qualities. Others favor a subjective line of thinking, going strictly for the films they enjoy more. A third group thinks that good films and films they like are one and the same. Flickchart doesn’t force you into either way of thinking, but lets you create your list according to your own parameters. Choosing between two films can be hard. I’ve already mentioned Blue Valentine vs Before Sunset. What about Back to the Future vs Raiders of the Lost Ark? Or The Empire Strikes Back vs The Shawshank Redemption? The Breakfast Club vs Groundhog Day? How about a more unorthodox battle, like The Devil Wears Prada vs Saw? It can be equally tricky to decide between two so-so films, such as Charlie’s Angels vs Dan in Real Life. And just which is worse: Street Fighter or Super Mario Bros? Flickchart doesn’t allow for ties; there’s no Skip button (reloading the page will bring up a new match-up, but that’s not in the spirit of things.) One must always choose. 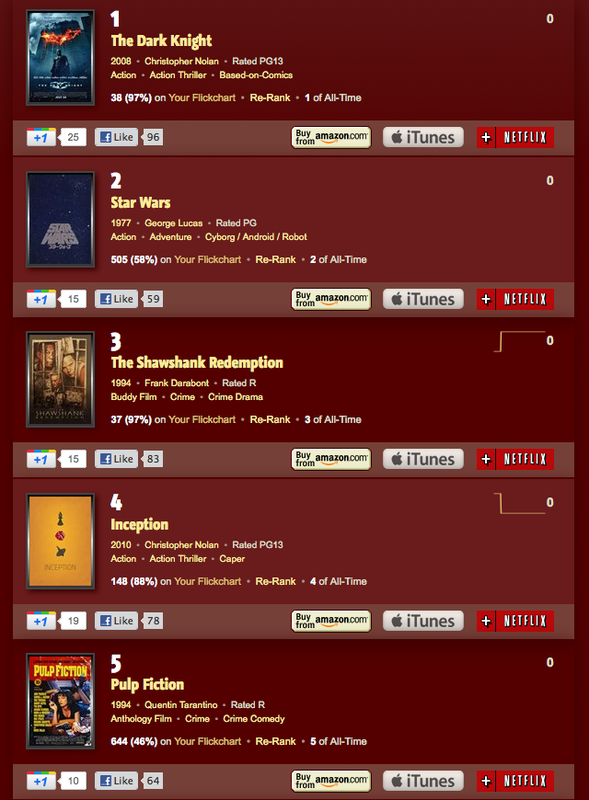 When you get tired of ranking random films, you can employ some of Flickchart’s various filters. You can choose to rank only films from the 1970s, or specify it further to 1977. Maybe you just want to rank action movies. Or Pixar films. Or Best Picture Oscar winners. If you just want to get new stuff on your chart, you can use the Unranked filter and only be presented with films you haven’t ranked yet. And if fine-tuning the top 20 on your chart is what you want to do, you can restrict your match-ups to just those 20 films as well. Flickchart offers plenty of other features too. Every match-up has a discussion page where you can leave a comment on your reasoning for your choice and see what other users have had to say. Then there’s the global charts, where the win percentages of all films are compared against each other to produce a list of Flickchart’s favorite films. Here too you can use filters to get specific information. You can also get recommendations on the best films you haven’t seen of various types. If you’ve added other users as your friends, Flickchart allows you to combine the rankings of you and them to find out what your combined favorite films are, or what the best films neither of you have seen yet are. New features are added frequently; the Flickchart of today has more bells and whistles than the one I joined a few years ago, and more is always on the horizon. But the core essence of pitting one film against another remains the same. Is Flickchart a useful tool for making ranked lists? It can be, but you have to work at it. If you just rank random movies, getting anything fully accurate will take a very long time as a lot will hinge on getting “the right” match-ups. If you use the re-rank feature diligently, you can get something good going. That said, I don’t tend to look at Flickchart when I make my Top 10 lists here on the blog. The main reason is that my Flickchart isn’t in perfect order. During my time as a Flickchart member, I’ve picked winners in over 14000 match-ups, but there are still oddities on my list. Some films are way higher or lower than what feels right. Plus, I’m very fickle. From discussions with fellow Flickcharters, I know there are people who feel there is a perfect order for the movies they’ve seen. I’m of the mindset that my opinions can sway daily. 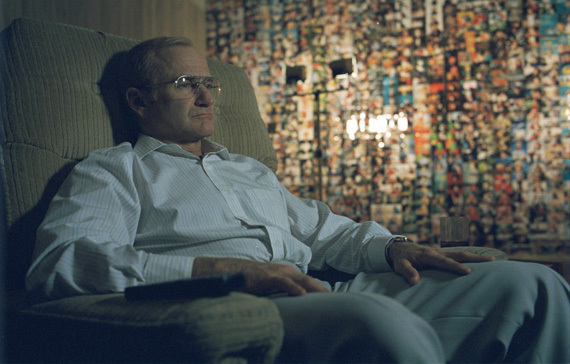 I might pick the black comedy of The War of the Roses over One Hour Photo one day, only to find that the latter’s creepy atmosphere speaks more to me the day after. Movies drift in and out of my top 20 with ease, whereas other users keep a tight lock on their top spots. Different strokes. Why do I keep using Flickchart then? Primarily, because it’s fun. It’s fun to just think about random films I’ve seen and discover what it is I really like about them, and seeing my list change and transform is oddly satisfying. It can also be a source of revelations about my viewing preferences. I might file a movie away as a 3/5 after first seeing it, only to later realize that I keep choosing it over films I thought I liked more. There are also more general observations to be made. For instance, I’ve never considered romance to be one of my favorite movie genres, and yet my Flickchart top 20 has a pretty high amount of them, all films I truly adore. Apparently, I do love me some well-made romances after all. As you might gleam, there are many aspects, features and uses when it comes to Flickchart. Some use it as their primary way of keeping track of films they’ve seen. Others employ it to calculate their accurate ranking list of movies. Others still, like me, see it as an entertaining time-killer. Either way, it’s a site well worth checking out. You might just learn something about yourself. It made me realize I had a new favorite movie a while ago. So go to Flickchart and start ranking. If you do, feel free to add me as your Flickchart friend at my profile page there. After the somewhat weak year that was 2003, we come to 2002. What is there to say about this year? Not much. It was a good year, thus making for a solid top 10. So with little to pontificate about regarding 2002, I’d like to take this space to talk about the fleeting nature of these lists. I am by no means done with any year film-wise. Not yet, and I don’t think I ever will be. There are always more movies to see, from critically hailed modern classics to gems that have gotten lost in the shuffle and are waiting to be discovered. So it’s no wonder that the lists can get slightly dated with time. Not just in terms of the ranked order (which can change from day to day), but also in which films are included. For example, I hadn’t seen A Single Man when I made my 2009 list, but if I had, it would definitely have made the cut. The same goes for the wonderful documentary Best Worst Movie. Rather than going back to updating the lists when necessary, I’m fine with just leaving them as they are. All lists are windows into brief moments in time. “This is how Emil felt on this day”, is what they proclaim. Even if I see some 2002 movie later this week that would make the cut for this list, it doesn’t change the fact that this here is a collection of 10 movies I really enjoyed. To offer a general view of what kind of films I like has always been the purpose of these lists, and this goal is still accomplished by leaving them as they are. So now, on to the list for 2002. As always, this goes by the release dates listed on IMDB. Two strangers collide in a traffic accident. One is a lawyer at the cusp of his big break, the other a recovering alcoholic trying to gain custody of his children. The meeting causes a delay for both of them, setting them off on a spiralling path through the day where both will try to exact revenge on each other and struggle with determining who is right and who is wrong. A cleverly written film where we can sympathize with both sides of a conflict. 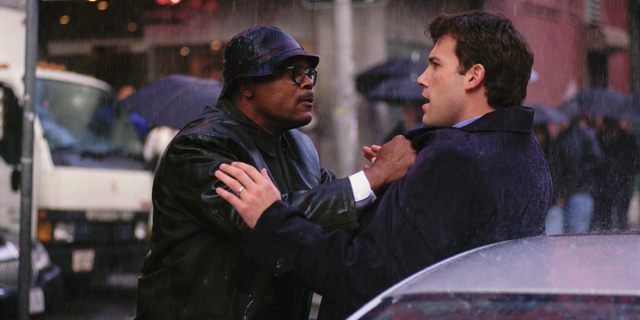 Ben Affleck puts in one of his best performances, while Samuel L. Jackson is as fun as always. A thriller that really gets under your skin, through a protagonist who’s troubled both psychologically and socially. Loner Sy (played expertly by a subdued Robin Williams) lives through the photos he developes for his customers, experiencing their joys that he himself has none of in his own life. But when he discovers that injustice is done to people he care about, he gradually snaps. It’s a story of morality and a reminder of how little we know of others, of the things we keep from them ourselves, and of how the grass isn’t always greener on the other side.